Ancient Egypt has a myth relating the a battle between Upper and Lower Egypt. 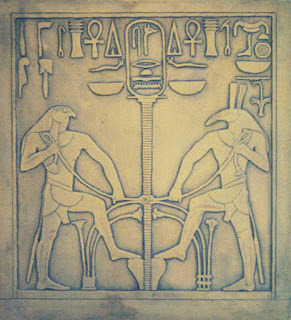 In this myth, The God Set ruled Upper Egypt, and Horus the Lower Kingdom. The war ends with the unification of Egypt, a parable for the creation of the Jesuit New World Order, however the circumstances surrounding the close of fighting are stranger than you would think. Upper Egypt conquers Lower, however not before both kingdoms begin worshiping Horus.